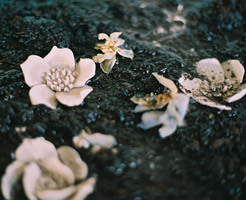 This vast and delicate work comprised of thousands of fragile handmade unfired china clay flowers. 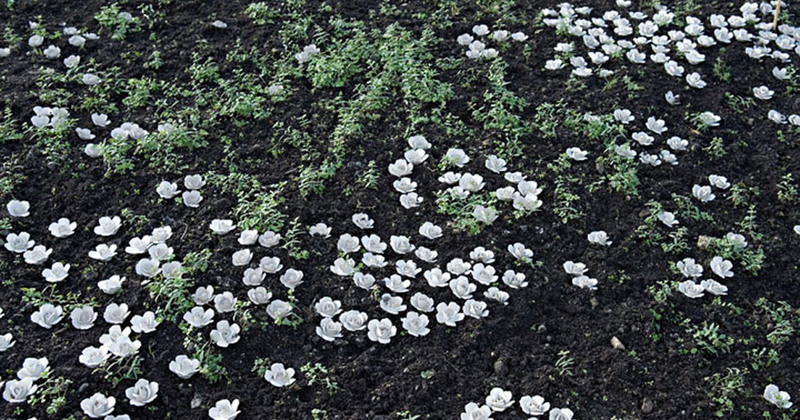 They weave in and out of the walkway that ambles across the base of the Eden Project site. 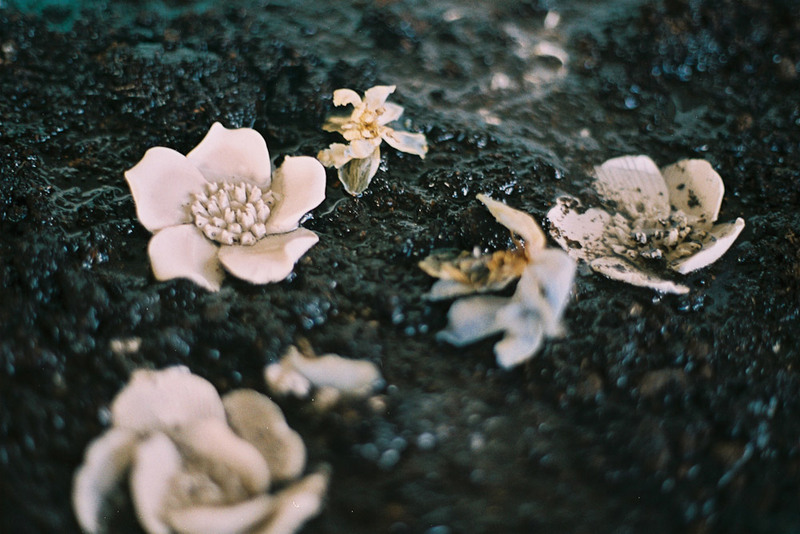 The ten thousand fragile handmade flowers deteriorated every day against the conditions of the weather, exposed and vulnerable, a poetic suggestion of imminent change. 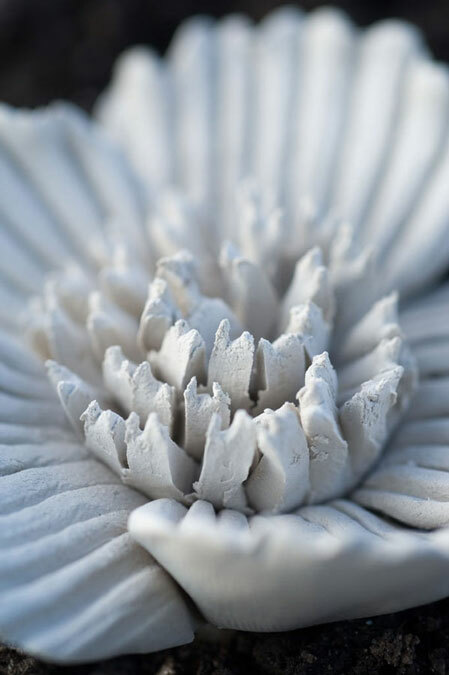 The change that could be observed within this vast work focused on the china clay materials returning through their demise back to the former clay pit that they were sitting on. 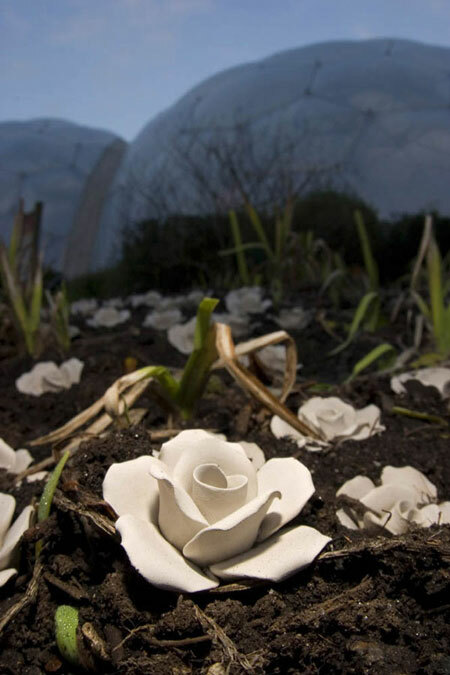 Blossom was an installation work made for the Eden Project site: the artist commissioned twenty female artisans in Stoke-on-Trent to produce a variety of handmade unfired china clay flowers – 10,000 in total – that were then ‘planted’ along the walkways that lead to the biodomes. 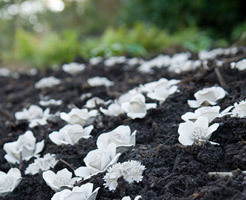 As the flowers were unfired they slowly deteriorated and, since the Eden Project had been constructed on the site of a former china clay pit, effectively returned to their place of origin. 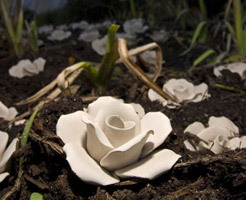 The work highlighted the cyclical nature of growth and the intimate connections between places. 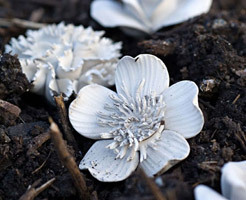 Blossom and Specimen are conceptually linked: both projects involve the slow deterioration of unfired china clay flowers but in two very different locations. 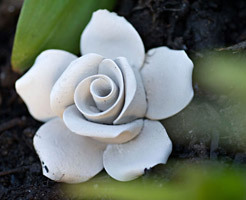 For some time the concept of using broken china had been in Twomey’s mind, and she took this idea with her when she visited the Eden Project, but found that it was too aggressive for that context. 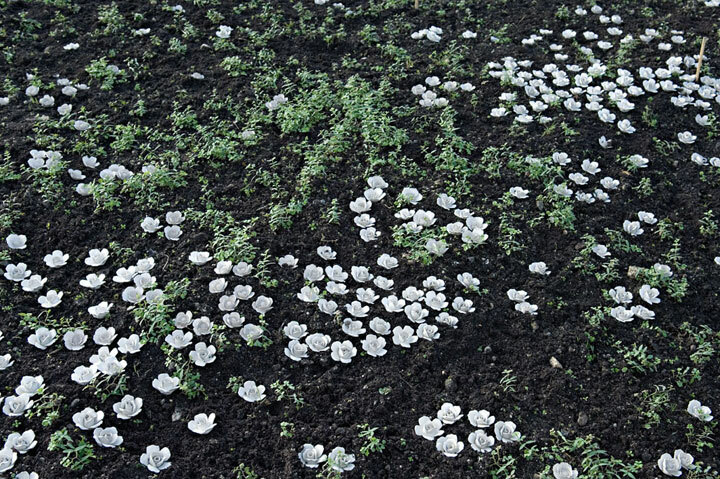 Leading to the biodomes are large walkways – a key element in the landscaping layout and for the movement of visitors - which registered themselves as an appropriate site, although it was the middle of winter and the banks beside these thoroughfares were mulched over. 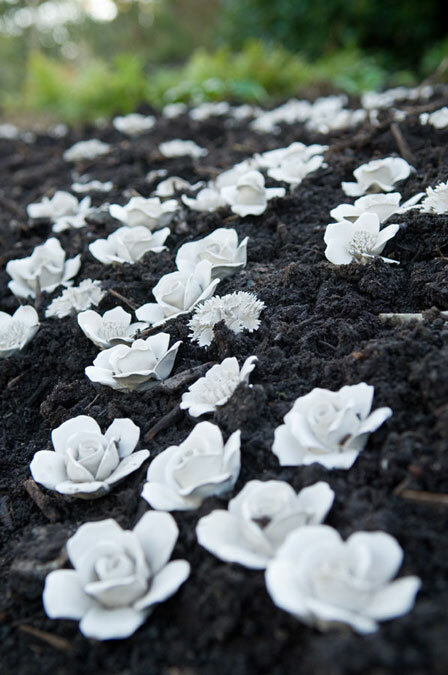 One might not immediately think of linking this environmental site and the potteries in Stoke-on Trent via an alfresco, site-specific installation, but this was the course Twomey took. 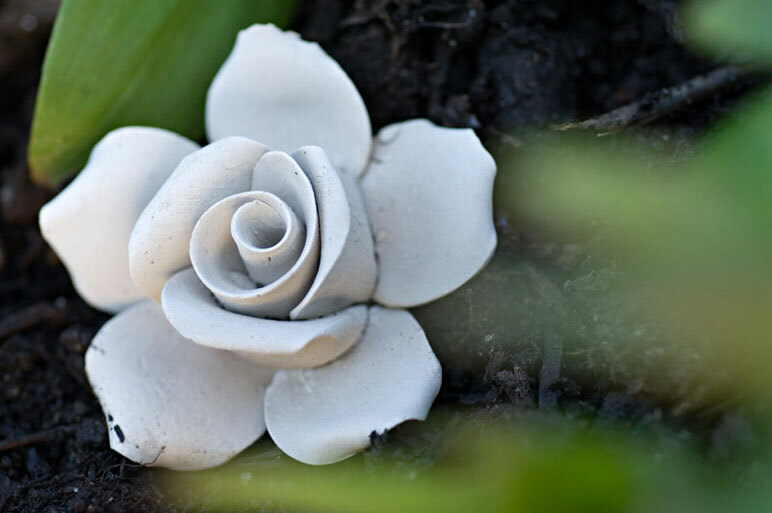 She found out that the making of ceramic flowers – intended to be used in floral ornaments - is a skill which is dying out in the ceramics industries of Staffordshire and she commissioned these artisans to produce a spectrum of blooms, especially roses because of their iconic power. 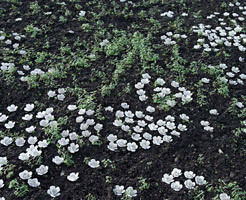 Then occurred a hands-on task of floral production of positively Herculean proportions – twenty ladies shaped 10,000 flowerets in five weeks. 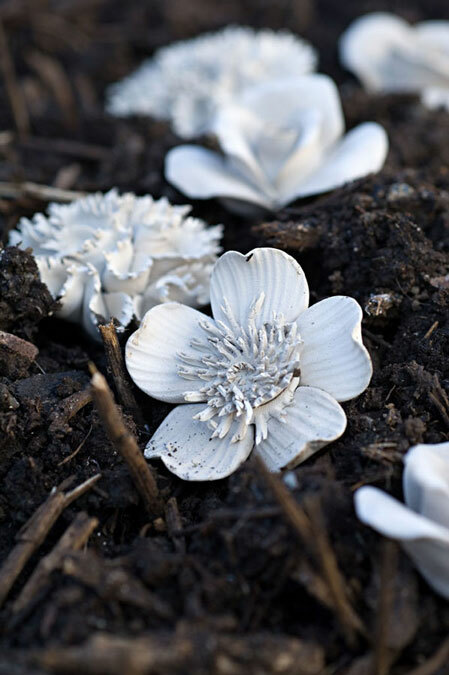 The “Blossom” installation lasted for over a month; the Eden Project supplied a team of seven horticulturalists who “planted” 7,000 blooms, and, as they melted – for they were not fired – their numbers were refreshed from the 3,000 that remained. 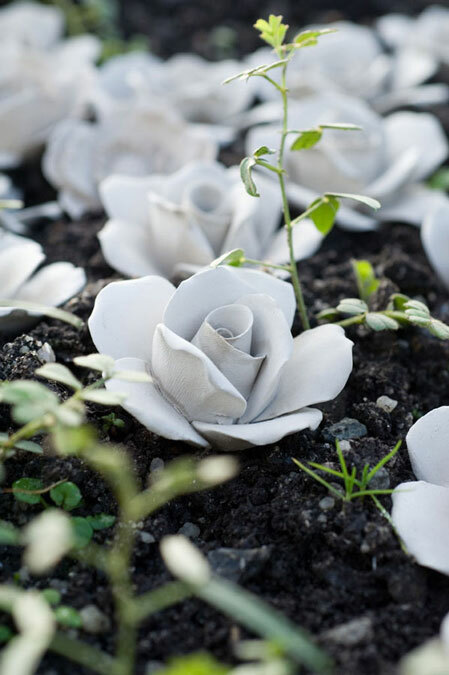 The myriads of pale clay petals against the dark mulch had, as predecessors, such highly-regarded ornaments as ceramic posies and nosegays and flower-laden baskets, which one finds in “display cabinets” and other prestigious positions in homes throughout the world. 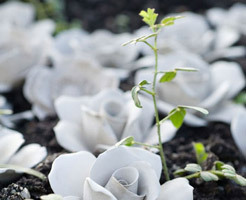 The decomposed blooms will not adversely affect the soil structure, and that this fact was taken into consideration alerts one to issues of responsibility regarding climate change. 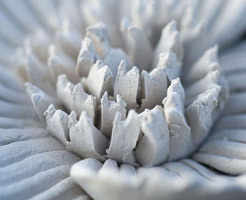 “Blossom” underlines the question of ecological interdependence and is a reminder of how seemingly disparate, wholly unrelated places - in this case pottery factories and a country’s major environmental undertaking - are intimately connected, for the Eden Project has been constructed on the site of what was once a china clay pit.